Anish Kumar is now a well-known persona in the journey of fitness and health, who have had his own share of ups and downs but rose above challenges with his sheer consistency to keep a goal, a strife to fitter life. Laziness, lack of enthusiasm are just some reasons for us to excuse ourselves from daily workout routines. Here stands a man, who overcame constant health and physical problems so he could find himself back as his old athletic self. Here’s his story. Anish, now 26 years old, is from Punjab and was born and brought up in Delhi, finishing his schooling, graduation and post-grad all from there. With a passion for cricket and an athletic background, his ambition was to take the sports up as a dream profession. Sadly, back in 2009, during his 11th grade, he met with an accident that severely injured his left ankle. A grievous mistake on his treatment delayed his recovery greatly. Hailing from Punjab, where it is believed that feeding a person well is the cure for ailments, be it tension or any injuries, desi-ghee, panjiri, etc. became a part of his daily diet on the pretext of returning his lost strength. But during 15 months of staying on this diet, Anish’ weight increased by 30 kgs. making him weigh a whooping 105 kilos by 2011, during the beginning of his graduation. Anish took it upon himself to shed the extra pound he gained during the healing process. Looking no further, he resumed with his cricket and tennis practice, changing his daily meal routine for a nourishing diet plan. It took no less than 2 and a half years to drop a good ton of 20 kgs, not the simplest achievements for someone who just walked off a severe injury. As 2014 arrived, Anish decided to take up an MBA course at Faculty of Management Studies (FMS), One of the top 3 MBA colleges in Delhi. But things did not look good as studies and life took a toll that made keeping the healthy habits a hard task. Unhealthy junk food took the wheel of his daily meal plans. The intake continued as a normal habit even around June 2016 when Anish moved to Mumbai for his first job posting. You could say he almost survived on fast foods for about two years till another bad incident swooped him back onto the hospital bed. May 2017, Anish, faced a random mild pancreatitis attack which led him to be immediately admitted in a hospital. After few tests, high contents of lipase and amylase were found in his system, something almost rare to be inhibiting a body that isn’t frequented by alcohol intake. 2 weeks of hospitalisation stripped Anish off any energy to get back to his daily lifestyle. Strong medications that were advised for next 15-20 months, only made him more lethargic and sans stamina. As a lover of sports and energetic activities, the lack of willpower to get back to normal life discouraged him to move around. It was time when Anish took matters into his own hands. If under-performing was his mental setback, he was going to perform better than he has ever had his entire life. His inspiration from the past sports background helped him face all the obstacles there were in order to achieve a fitter body. 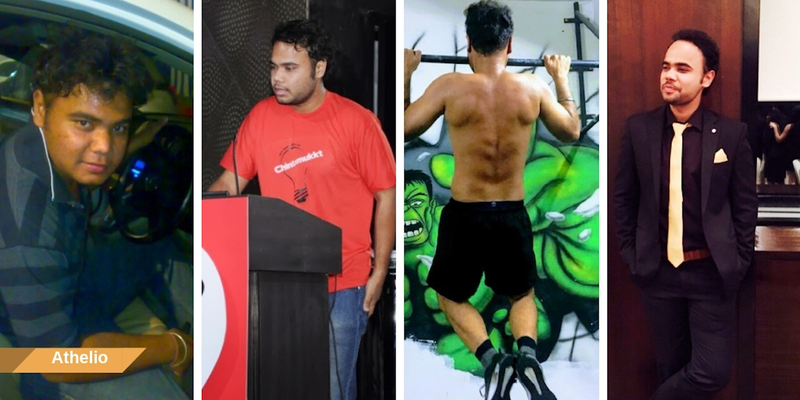 When cardio and weightlifting felt like lacking the motivation he needed, Anish chose Crossfit. Crossfit is the most extreme professional workout regime one can take. Not to forget, here was a man, combating two hospital visits in 7 years and months of medication, ready to push his own limits. Exercise routine was followed by daily protein shake intake as being a vegetarian was not going to stop him from filling his system with the nourishment it deserved. Workout became a lifestyle, a stress-buster and his personal form of medication. Sheer amounts of determination and courage now has him toned up, healthy and muscular like a new man out of the old shell of diseases and setbacks. Losing focus was out of his routine as phones and any other distractions were kept at bay during workout hours. Keeping in mind the days where he couldn’t walk properly due to his weight and health, Anish Kumar built his body upon stamina and strength that could withstand any physical adversities that comes his way. “We are products of our choices. We all make mistakes. Either we can crib about it OR go hard on ourselves for making a mistake OR we can just accept that we are humans & its completely OK to make a mistake. All we have to do is to take a STEP towards future. Its not going to happen in a day. Its not going to happen in a week. Its not going to happen in a month. It takes a lot of time..
We all are going through struggles, some are internal & some are external. Breakfast- Ginger tea or Black Coffee. Choices of peanut butter sandwich with brown bread or Oats/Muesli with skimmed milk. Upma would also be part of breakfast on some days. Lunch- 1 cup of brown or white rice with daal. Sabji consisting of Paneer or tofu with salad and yogurt. Dinner- Wheat based roti with daal and sabji. Keeping a strict regimen never meant he couldn’t touch the food he loved or craved. Cheat days meant hanging out with friends and eating which ever cuisine Anish laid eyes on. It not only broke the mundane routine for daal and sabji but provided him experiences of tasting food from all around. Secret to such a life-changing journey is to give your all, the 100% of it. The process of transformation should be enjoyed, encouraging, only then the results will come satisfactory. Anish is now a business manager of a successful firm and lets nothing make him take a step back. 8 years of life-changing experiences brought him where he is now. Happy and confident soul with a tremendously inspiring story to tell.